John Legend, Sara Bareilles and Jessica Biel are now officially Emmy nominees! The talented trio were among the performers recognized by the 2018 Emmys for their work this year. 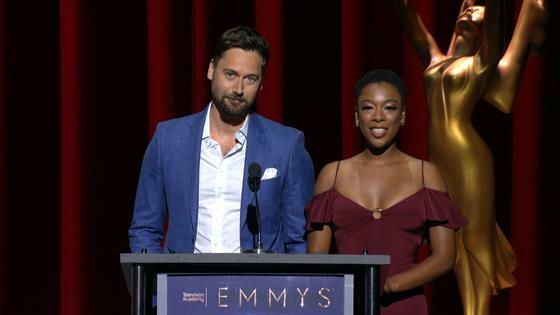 On Thursday, Handmaid's Tale star Samira Wiley and NBC's New Amsterdam star Ryan Eggold jointly announced the award show nominees live from the Wolf Theatre inside the Television Academy's Saban Media Center. Legend was nominated for Lead Actor in a Limited Series or Movie for his work in Jesus Christ Superstar Live in Concert, while Bareilles was nominated for Supporting Actress in a Limited Series or Movie for the musical production. Biel was nominated for Lead Actress in a Limited Series or Movie for her work in The Sinner. Take a look at the gallery below to see all of the stars who received their first Emmy nominations today! Watch the 2018 Emmys on Monday, Sept. 17 at 8 p.m. ET/5 p.m. PT on NBC.